Leadership Hall of Fame: Who Is an Executive? What qualities make an executive? How are they different from other personnel at a company? 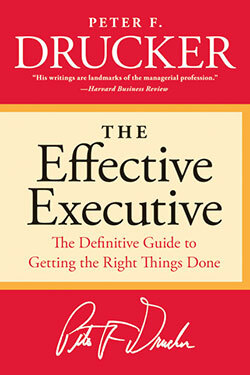 We continue our Leadership Hall of Fame series, a year-long look at the top business books and authors, with an excerpt from the seminal book on management, The Effective Executive (1967) by the late Peter F. Drucker. Every knowledge worker in a modern organization is an “executive” if, by virtue of his position or knowledge, he or she is responsible for a contribution that materially affects the capacity of the organization to perform and to obtain results. This may be the capacity of a business to bring out a new product or to obtain a larger share of a given market. It may be the capacity of a hospital to provide bedside care to its patients, and so on. Such a man or woman must make decisions; he cannot just carry out orders. He must take responsibility for his contribution. And he is supposed, by virtue of his knowledge, to be better equipped to make the right decision than anyone else. He may be overridden; he may be demoted or fired. But so long as he has the job, the goals, the standards, and the contribution are in his keeping. This fact is perhaps best illustrated by a recent newspaper interview with a young American infantry captain in the Vietnam jungle. Knowledge work is not defined by quantity. Neither is knowledge work defined by its costs. Knowledge work is defined by its results. And for these, the size of the group and the magnitude of the managerial job are not even symptoms. Having many people working in market research may endow the results with the increment of insight, imagination, and quality that gives company the potential of rapid growth and success. If so, two hundred people are cheap. But it is just as likely that the manager will be overwhelmed by all the problems two hundred people bring to their work and cause through their interactions. He may be so busy “managing” as to have no time for market research and for fundamental decisions. He may be so busy checking figures that he never asks the questions, What do we really mean when we say “our market”? And as a result, he may fail to notice significant changes in the market that eventually may cause the downfall of his company. But the individual market researcher without a staff may be equally productive or unproductive. He may be the source of the knowledge and vision that made his company prosper. Or he may spend so much of his time hunting down details–the footnotes academicians so often mistake for research–as to see and hear nothing and to think even less. Throughout every one of our knowledge organizations, we have people who manage no one and yet are executives. Rarely indeed do we find a situation such as that in the Vietnam Jungle, where at any moment, any member of the entire group may be called upon to make decisions with life-and-death impact for the whole. But the chemist in the research laboratory who decides to follow one line of inquiry rather than another one may make the entrepreneurial decision that determines the future of his company. He may be the research director. But he also may be–and often is–a chemist with no managerial responsibilities, if not even a fairly junior employee. Similarly, the decision what to consider one “product” in the account books may be made by a senior vice president in the company. It may also be made by a junior. And this holds true in all areas of today’s large organization. I have called “executives” those knowledge works, managers, or individual professionals who are expected by virtue of their position or their knowledge to make decisions in the normal course of their work that have impact on the performance and results of the whole. What few yet realize, however is how many people there are even in the most humdrum organization of today, whether business or government agency, research lab or hospital, who have to make decisions. For the authority of knowledge is surely as legitimate as the authority of position. These decisions, moreover, are of the same kind as the decision of top management. The most subordinate, we now know, may do the same kind of work as the president of the company or the administrator of the government agency, that is, plan, organize, integrate, motivate, and measure. His compass may be quite limited, but within his sphere, he is an executive. Similarly, every decision-maker does the same kind of work as the company president or the administrator. His scope may be quite limited. But he is an executive even if his function or his name appears neither on the organization chart nor in the internal telephone directory. And whether chief executive or beginner, he needs to be effective. Reprinted by permission from The Effective Executive by Peter F. Drucker (Harper Business).